Oh wow, these Feta Cheese Herb Muffins certainly have a taste of the Mediterranean about them. 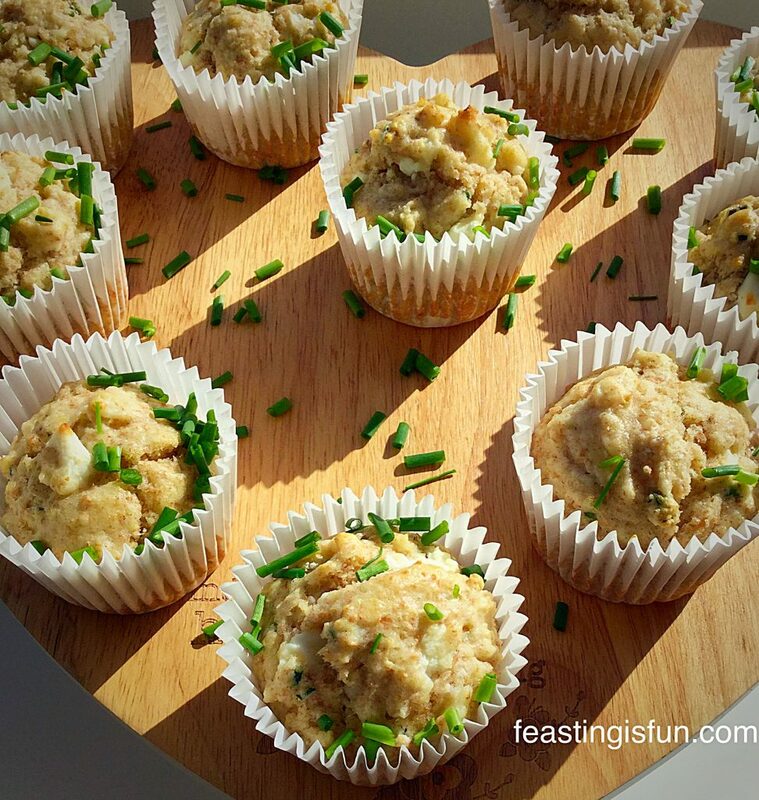 Feta Cheese Herb Muffins perfect for eating any time of the day! Sorry, I know I usually write a little intro, but these Feta Cheese Herb Muffins are so, so good I wanted to tell you about them straight away. Like an excited child with news of their day at school, I am literally bursting with excitement over how good these are. 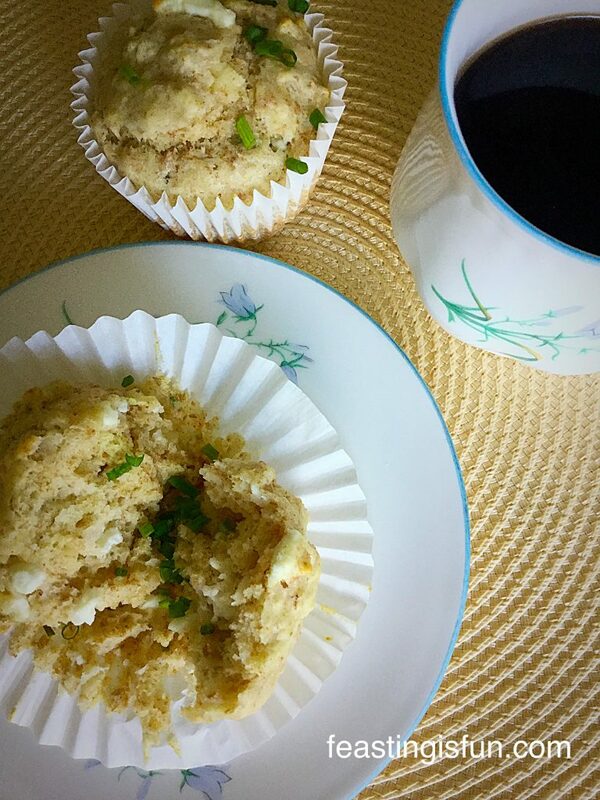 Salty feta cheese, that almost melts, in a slightly healthier muffin – I’ve added in some wholemeal flour, without any added heaviness – accompanied by the delicate onion flavour of fresh chives and just the teeny tiniest hint of fresh mint! 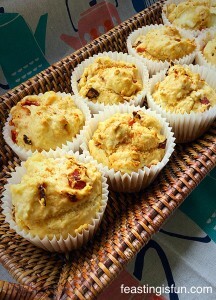 Feta Cheese Herb Muffins delicious warmed for brunch. 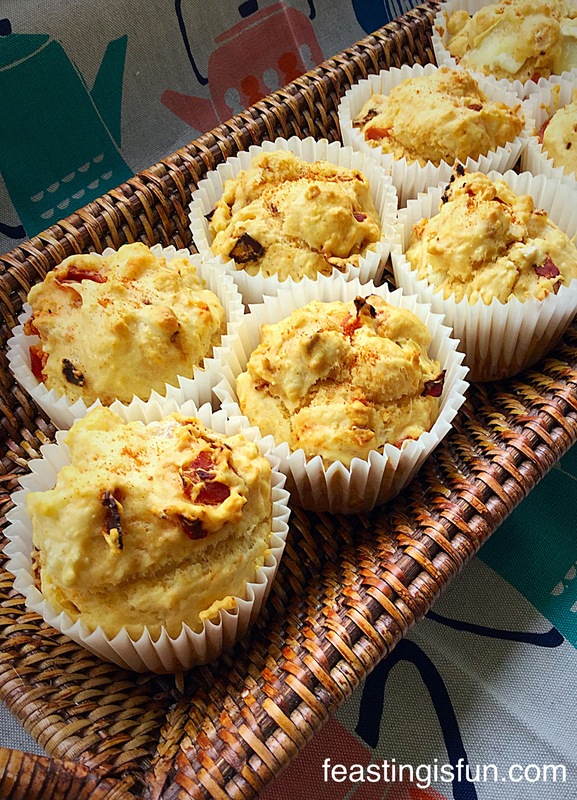 Having first made my friend, Jackie Heaton aka The Baking Nanna’s Cheese Bacon Breakfast Muffins which are absolutely delicious, I have loved coming up with different variations of the muffin. 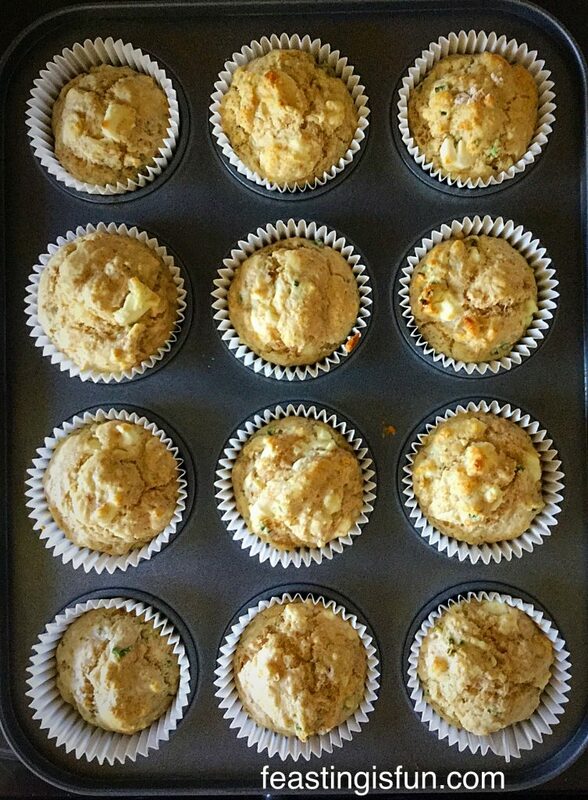 Today I wanted to see if I could add wholemeal flour to the muffins, without making them heavy. So I replaced one third of the flour with plain, wholemeal flour. I increased the baking powder and hoped that the balance would work. It totally did. The wholemeal flour adds a subtle depth of flavour that completely works with the salty feta cheese. I thoroughly enjoyed a late breakfast this morning feasting on these flavour packed morsels. Feta Cheese Herb Muffins so good and so easy to bake. Freshly cut from the garden, both the chives and the mint add a subtle brightness to the Feta Cheese Herb Muffins. None of our children noticed the mint, I was a bit worried thinking that might be the deal breaker! There are only three mint leaves in the whole recipe, yet they provide a fantastic, fresh flavour, without making the muffins taste like toothpaste!!! If you don’t have fresh herbs in your garden, they can easily be grown on a window-ledge. I buy mine growing in pots, from the supermarket. Woody herbs such as sage, thyme, oregano and rosemary grow in the garden, as do the chives, which have recently started to sprout. Mint I grow in a tub, as it can be a bit of a thug if planted in the open ground, rapidly spreading and smothering other plants. There is a place for both fresh and dried herbs in my kitchen. In this recipe however, I would only recommend using fresh herbs. Look out for upcoming posts where I will share tips and recipes on the vegetables and herbs I grow. 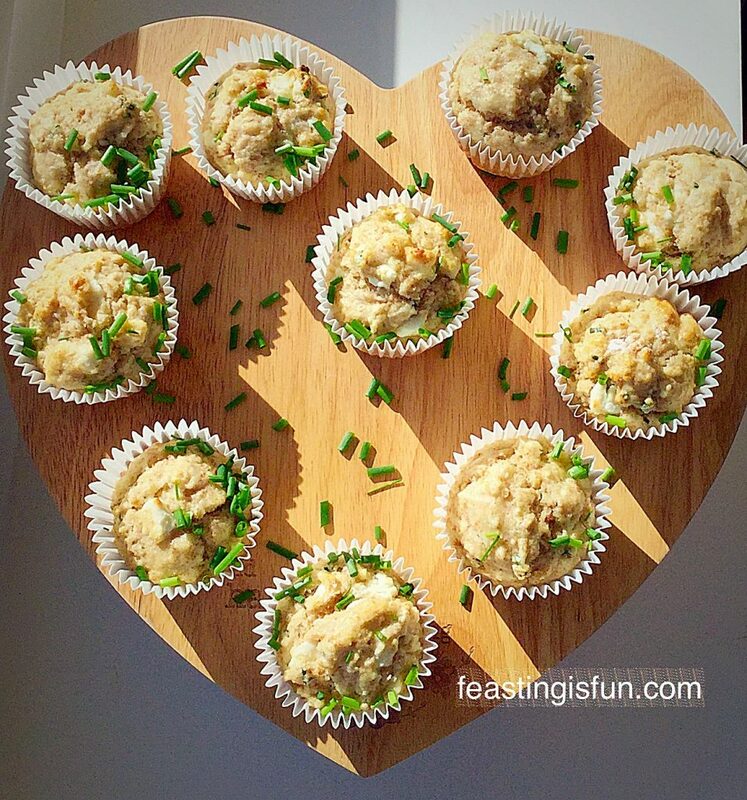 Feta Cheese Herb Muffins delicious, healthier and low in fat. Measure the milk into a jug. Crack in the 2 whole eggs and add the oils. Stir with a fork to combine – wet ingredients. 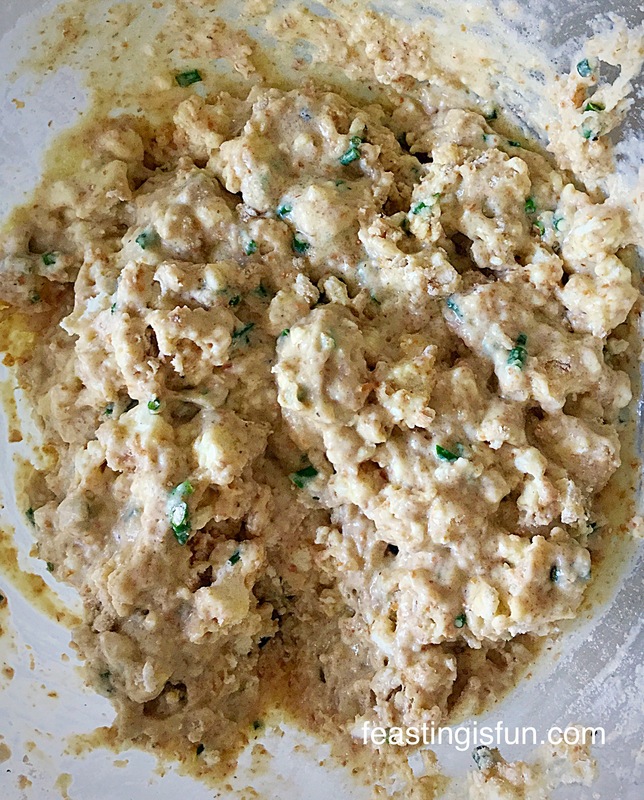 Into a large bowl add both the flours, the crumbled feta cheese, black pepper finely chopped mint and chives. Stir with a fork ensuring all the pieces of crumbled feta are coated in flour – dry ingredients. Make a well in the centre of the dry ingredients and pour the wet ingredients into it. Stir lightly with a fork until almost combined. Note: lumpy batter ensures tender muffins, if you over mix the muffins will be tough! Here is good, lumpy batter. Divide the batter equally between the 12 muffin cases. Place the muffin pan into the preheated oven and bake for 15-20 minutes (mine took 17 minutes). The muffins are cooked when the are starting to turn golden brown and are firm to touch. Once baked remove the muffins from the oven. Feta Cheese Herb Muffins hot straight from the oven. 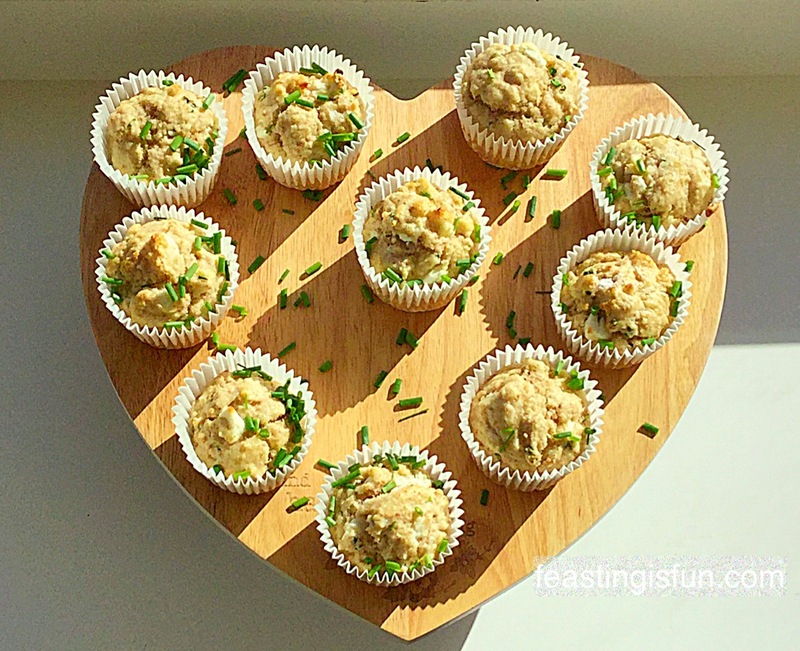 Allow the Feta Cheese Herb Muffins to cool slightly on a cooling rack. 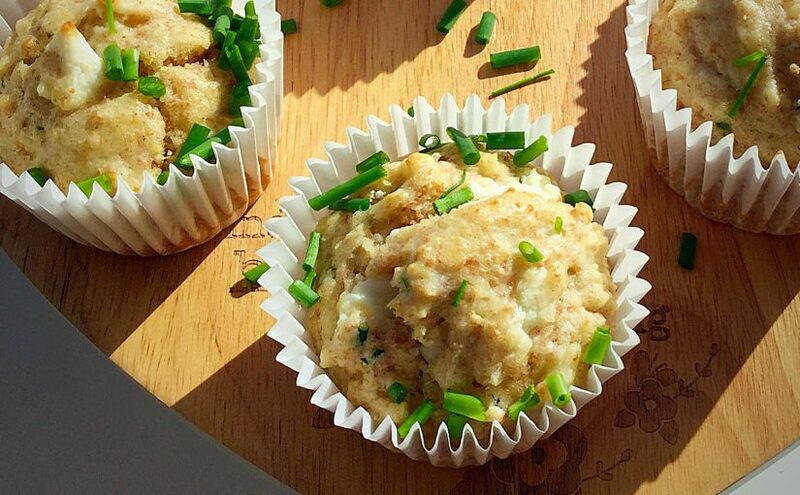 Serve the delicious Feta Cheese Herb Muffins warm with an extra sprinkling of freshly cut chives. Store in an airtight container for up to 3 days. To refresh pop in a medium heated oven for 5 minutes and they will regain their freshly baked flavour. These Feta Cheese Herb Muffins are the perfect addition to any packed lunch or picnic. They are a perfect, portable, fairly healthy snack and great for sharing. Long days at the office? 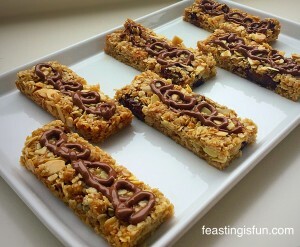 These take barely 30 minutes to make and bake and then you have breakfast/lunch sorted for a few days! 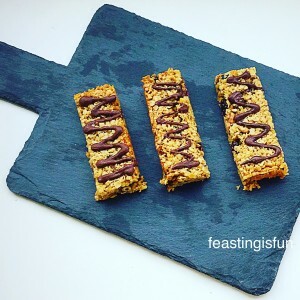 I love coming up with easy to make, nutritious food, that means you always have something delicious to fall back on instead of always reaching for a chocolate bar or packet of crisps. With food made at home, you know exactly what has gone into it and it always tastes so much better than anything you can buy. Chorizo Goats Cheese Muffins utterly delicious. Coconut Almond Date Flapjacks a slow release energy bar wherever you are. Are you good about eating breakfast and taking a packed lunch to work, or do you grab a sweet muffin with your morning latte? Hopefully I’ve given you some tips to make mornings less stressful on some days? There are always going to be days when you oversleep, or no matter what you do, you’re running late. If you can plan just a little bit, then a bad start to the day needn’t set the tone for how the day pans out! Thank you for taking the time to leave a comment. I really enjoy reading them. Likewise for all of you who have posted your makes and bakes on Twitter and Instagram. I love seeing how my recipe turns out in someone else’s kitchen! Have fun making and baking your feast.